In late 2011, all projects in the Nile Basin Development Challenge prepared ‘most significant change’ stories from the first phase of operations. One of the stories looked at project experiences with the installation of hydrological monitoring sites. NBDC Brief 10 is a summary of the story. A key objective of the Nile BDC is to gain insights into hydrological processes (e.g. water budgets and partitioning of rainfall between soil moisture, groundwater and runoff) in order to inform decision-making about different rainwater management options. 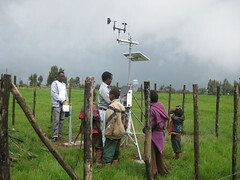 To do this, we have established hydrological monitoring networks in three research catchments, one in each of the woreda’s where the research is being conducted (i.e., Jeldu, Diga and Fogera). help establish a conducive atmosphere for the flow of knowledge between researchers and the communities and vice-versa. The three research catchments are almost certainly the most sophisticated hydrological experimental monitoring networks ever established in Ethiopia. As such they should be exploited to the full. If they are to be utilized successfully it is clear that participation from local communities and a range of stakeholders is vital.